Healthcare IT is on Fire! The shift to Electronic Medical Records (EMR) is spurred by $20 billion in government stimulus funding. Some 66% of medical practitioners now use tablets versus 45% in 2011. Nearly 46% of medical care consumers say they prefer mobile health apps for staying in touch with their providers. Fully 80% of doctors use Smartphones and medical apps. 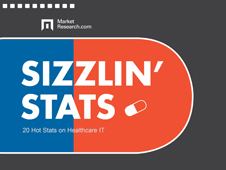 For these datapoints and more, fill out the form to this Sizzlin' Stats SlideShare.